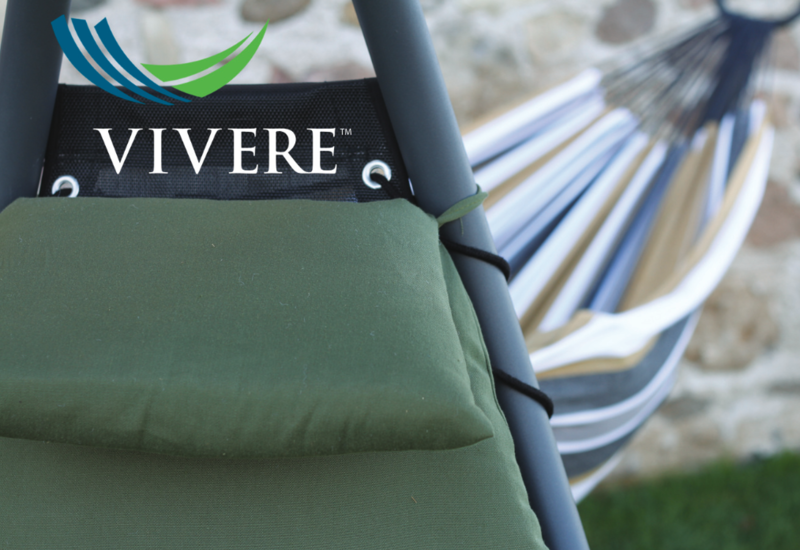 At Vivere Ltd, we believe in spending quality time with your family, balancing hard work with fun, taking a break from what’s going on around you, helping others, using hammocks as a place to rest our heads at night, and most importantly, relaxing the world. Our goal, #relaxtheworld, is also our mantra for living and one that we bring to you. We believe everyone should spend time #hammocking and we’re here to help spread that message and get you in a hammock. We design all our products in Guelph, Ontario, Canada and ship worldwide. You no longer need to travel for peace of mind and a relaxing escape on a Tuesday night or weekend at the cottage: you can keep your Vivere products in your home, in your backyard, or in a carrying case for easy access to where ever you travel! Whether you’re looking for high style, affordable outdoor furnishings, spirited designs and colours, or superior, durable fabrics, Vivere Ltd is your source for hammocks, outdoor seating options, and accessories. We work hard to make sure you can relax and experience a balanced lifestyle.